Considerate smokers (har, har) looking for an ashtray to deposit their refuse into can take a look at the ashcan. 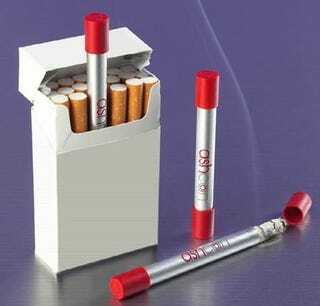 It's a personal ashtray that's shaped like a cigarette that lets you deposit your ashes inside while at the same time keeping the smoke from bothering others. The only downside to this is that it costs $2.40 per ashcan, so you'll have to either clean them out afterwards or invest in a lot of ashcans.